This year, Disrupting Law is back and bigger than ever. Eye-tracking technology to automate time-keeping, blockchain solutions for protecting creative copyright, and artificial intelligence to facilitate legal advice. These are just a handful of ideas presented by university students at Disrupting Law - Queensland's first legal hackathon. Disrupting Law is an initiative of The Legal Forecast and QUT Starters. The Legal Forecast is a not-for-profit run by early career legal professionals and law students who aim to advance legal practice through technology and innovation. QUT Starters is a student society building a culture of entrepreneurship and innovation at QUT. Students from a range of faculties and universities nationwide will come together from 3 to 5 August 2018 in search of the next best idea to advance legal practice in a novel way. If you are studying law, IT, business, engineering or design, Disrupting Law is an awesome opportunity to work closely with industry professionals. Over the weekend, students will be split up into 13 teams, partnered with each participating mentor law firm. Legal and non-legal professionals will be available to mentor students over the course of the collaborative weekend competition. Herbert Smith Freehills, Clayton Utz, Allens, King & Wood Mallesons, McCullough Robertson, Piper Alderman, Ashurst, HopgoodGanim, Corrs Chambers Westgarth, Law Squared, ClarkeKann Lawyers, Hall & Wilcox and Minter Ellison have confirmed their involvement. On Sunday August 5 2018, students will pitch their ideas to a “Shark Tank" style panel of legal and tech professionals in front of an audience of more than 200 people to take home various exciting prizes that will be announced closer to the date. 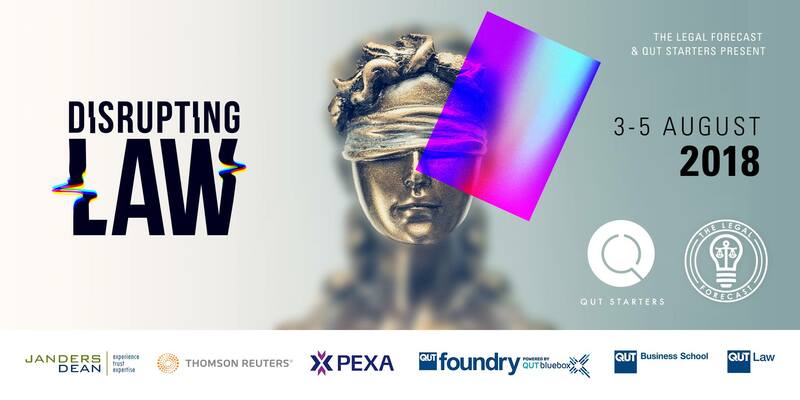 Tickets to compete in Disrupting Law 2018 and tickets to attend the Sunday night presentations (open to the public) are on sale now.